Often referred to as the “Rose City”, Camrose is a great place to visit. 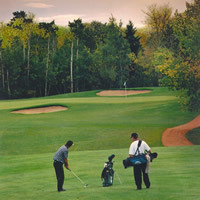 The golf courses in and around the city have a strong community feel and are very welcoming to all visitors. Nicknamed for the abundance of beautiful wild roses that grow in the parklands of the surrounding area, Camrose is undoubtedly a place you’ll want to explore. What better way to view the scenery than to take a walk through nature and enjoy a round of golf? After a full day of play at one of the many courses in the area, take some time to relax at Mirror Lake, centerpiece of the city and home to Camrose’s famous swans. Check out the listings via the Find a Course tab below to locate exactly the kind of play you're looking for.